Aspinalls - Launder Channel System. Corus. - UK Engineering Experts | Engineering Business UK | Qualified Engineers Lancashire | Mechanical Engineered Products | Mechanical Engineer Services. Aspinalls were awarded a contract to detail, supply and install a replacement full circumferential launder channel system on behalf of Veolia Water at the Corus Packaging Trostre Works. The launder channel was a double U-type launder incorporating inboard and outboard adjustable overflow weirs and also featured full circumferential scum boards and an integral drop box. All parts were manufactured from <?xml:namespace prefix = st1 ns = "urn:schemas-microsoft-com:office:smarttags" />GRP and sized to suit the incoming/outgoing flows of the 31m diameter settlement tank. 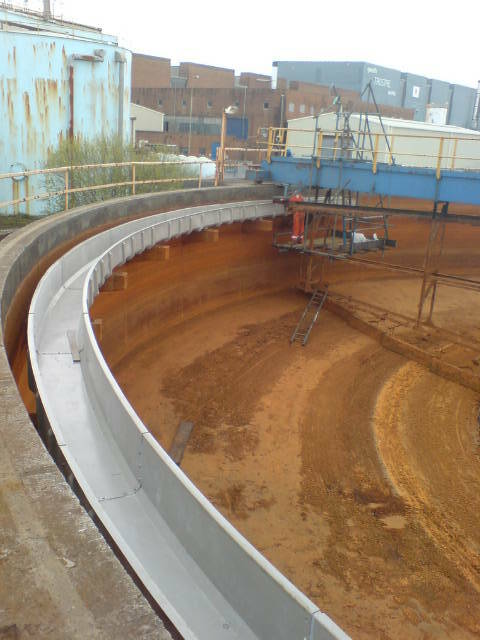 The GRP launder channel was designed in 47 separate sections, the channel sections were bolted together on site using an approved sealing technique to generate water tight joints.